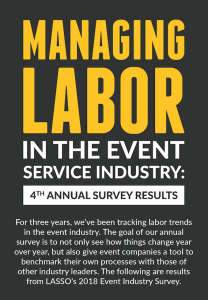 Are you charging your clients enough for your event labor? Or, are you billing significantly more than your competitors? It goes without saying that these are extremely important questions for event companies to answer so that they can keep their bill rates competitive, while not leaving any money on the table. 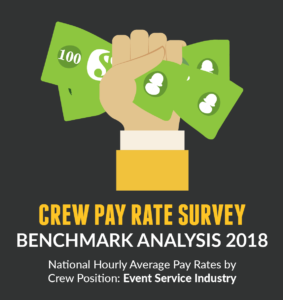 To provide some answers, LASSO recently conducted a poll to determine the average position bill rates associated with twenty common live event crew positions. We contacted a number of senior event executives who are currently active in the industry. Then, we used this data to assemble our 2018 position bill rate survey report. In this video infographic, you will find highlights from just a few of our findings. 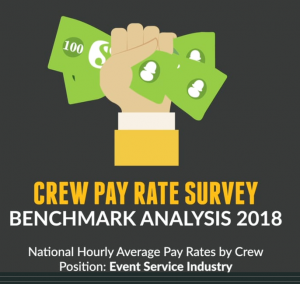 To view the results for the other 17 live event crew positions, you can download the full report here. The results of this survey were eye opening. For several positions, we see large gaps between what the majority bills, and what others bill. We hope that you are able to use the data found in this report to benchmark your own rates, with those found in the industry. For more information or if you have any questions, contact LASSO today.